Welcome to the Walter Burley Griffin Society of America web site. Our mission is to preserve the legacy of architects Walter Burley Griffin and Marion Mahony Griffin and the Prairie School of Architecture. MEETING: The twentieth annual meeting of the Walter Burley Griffin Society of America will be held during the weekend of 1-2 June 2019, in Decatur on Saturday, with an optional extension on Sunday to Springfield, Illinois. The morning session on Saturday will be held at the University Commons, Millikin University [marked “12” on the attached map]. Parking will be available in the visitors’ lot directly in front (south) of the Commons building. Doors of the Commons will open at 8:30 with the lectures beginning at 9:00 and ending at noon. Speakers include preservation architect Mike Jackson recounting the restoration of the Dana house; James Weirick returns to lecture on Griffin’s lost Shanghai plan; artisan and scholar Ted Ellison examines the glass mosaics of the Prairie School; and Paul Kruty prepares us for Millikin Place and the afternoon events. A buffet lunch will be served in the same building. The afternoon tour, which includes the four houses on Millikin Place plus the Millikin Homestead, will begin at 1:30 and end at 4:30, followed by a wine-and-cheese reception at the Adolph Mueller house, No. 4 Millikin Place, lasting until 5:30. Dinner is on your own. On Sunday morning, we will meet at 10:00 am at the Susan Lawrence Dana house in Springfield for private tours led by Mike Jackson and Anthony Rubano. ACCOMMODATIONS: The conference hotel is the Decatur Conference Center and Hotel, Route 36 & Wyckles Rd., Decatur, IL 62522, 217-422-8800. Please ask for the Griffin Society rate. Background: Millikin Place is a private street on the west side of Decatur, Illinois, that consists of four grand houses from 1909-11—two designed by Marion Mahony (for Robert and Adolph Mueller, at Nos. 1 and 4 Millikin Place), one by Frank Lloyd Wright and Marion Mahony (for E. P. Irving at No. 2 Millikin Place) and one by a California bungalow firm—plus a large Italianate mansion from the 1870s (the Millikin Homestead) and a group of interesting houses from the 1920s-30s (exterior viewing only). The three Mahony/Wright houses were built by the Chicago office of Herman Von Holst, who assumed Wright’s practice in September 1909 and hired Marion Mahony as chief designer. The three were landscaped by Walter Burley Griffin. The Society visited Millikin Place once before, in 2007, to coincide with the publication of our first book, Marion Mahony and Millikin Place. It looks to be a very exciting meeting. We look forward to seeing you there! Click HERE to download the registration form. Please send in your registration as soon as possible. It really helps. In addition to Kruty’s essays on each house, architect Tannys Langdon presents an engaging look into modern life in the Peters house, while homeowner Richard Berry reveals the travails and successes of living with the architectural masterpiece that is the Ralph Griffin house. Paul Sprague provides a careful analysis of the landscape plan for the Griffin house. All in all, a worthy addition to library of all lovers of Griffin, Wright, the Prairie School, Chicago and Illinois history, and the glory of American architecture. “The Society’s new book is fascinating, with many insights and images new to me.” James Weirick, University of New South Wales. “Reading it has been a pleasure. Excellent research, great illustrations, and reasonable analyses.” Donald Leslie Johnson, author The Architecture of Walter Burley Griffin. 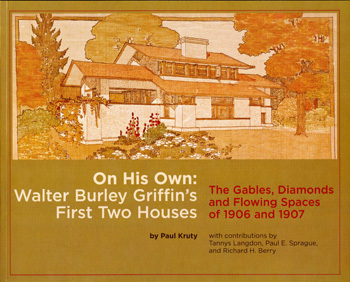 On His Own: Walter Burley Griffin’s First Two Houses; The Gables, Diamonds and Flowing Spaces of 1906 and 1907 by Paul Kruty, with contributions by Tannys Langdon, Paul E. Sprague, and Richard H. Berry. St. Louis, MO: Walter Burley Griffin Society of America, 2017. $25. ISBN 0-9793588-3-3. See the Publications page for pricing and ordering information.